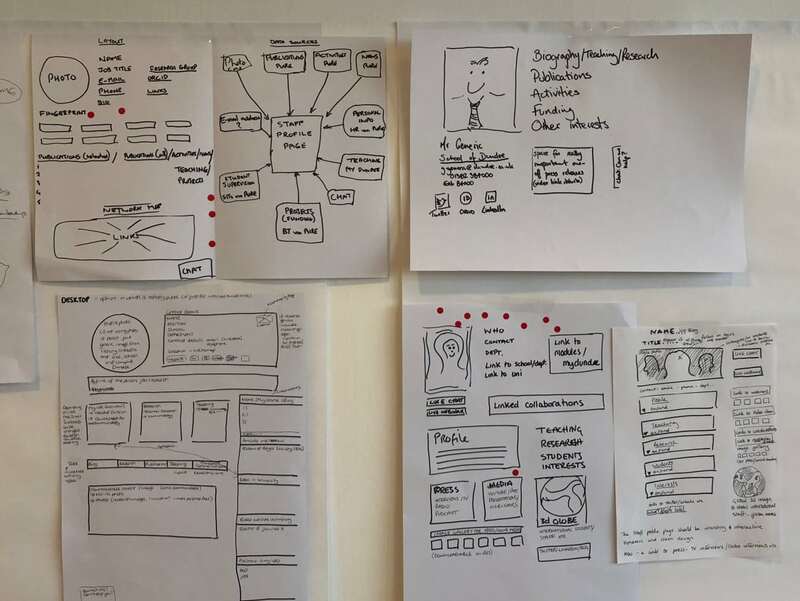 Our first Design Sprint took place on 13th February. 12 people from around the University gathered together with Rob (UX Manager) and myself (Design Manager) from Web Services. 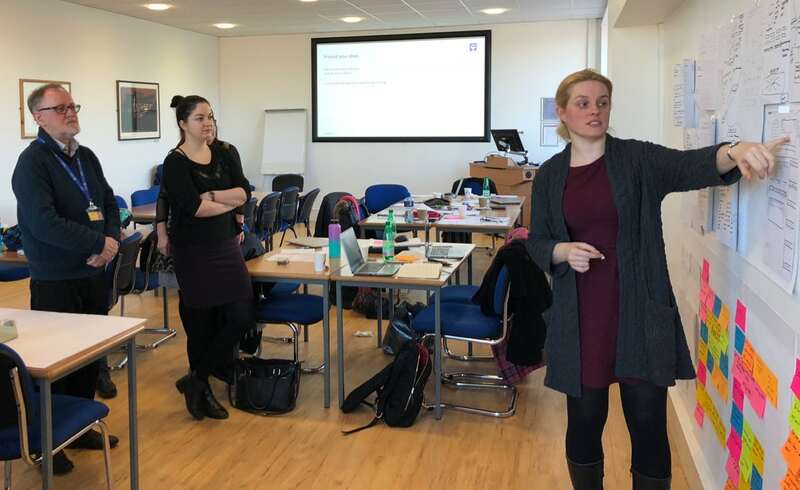 We spent a fun and informative day working together trying to solve one of the many problems we face as we create a new university website. The challenge we set ourselves for the day was solving this problem: How do we help people find staff information? 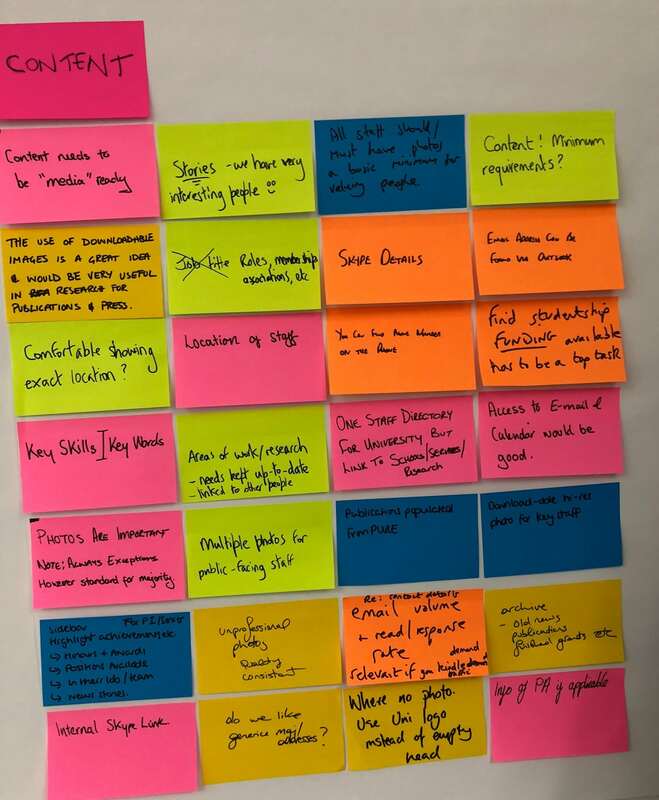 Everyone was encouraged to make notes during the morning, using a post-it note for each thought or point they wanted to discuss later. During a coffee break, these notes were grouped under headings like ‘Content’, ‘User Experience’, ‘Design’, and so on. After a free (and tasty) lunch, the group worked on defining goals and a target audience for the solution they would sketch out. We talked about what is a suitable goal using the HEART framework (Happiness, Engagement, Adoption, Retention, Task completion). 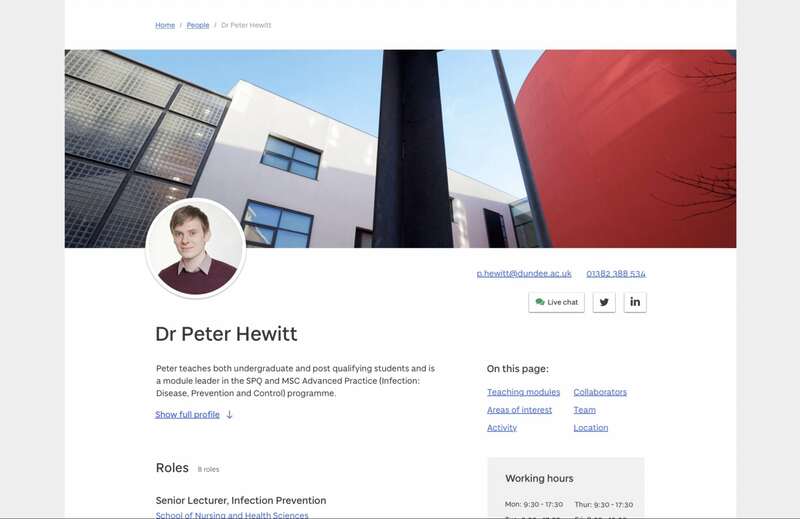 We discussed how a staff page (like much of our content) has to cater or adapt to many different audiences (prospective student, current undergraduate student, current postgraduate student, teaching staff, research staff, and numerous other variations). Then it was time to sketch! We used a technique called Crazy 8s to allow each member of the sprint group to get as many of their ideas down on paper as possible. Each person presented their ideas, then we voted on our favourites, and discussed them. We then moved on to sketch out what we each thought would be a great solution to the problem. There were a fantastic amount of great ideas being expressed here. And that is exactly the point of the Design Sprint process; to draw out the unique ideas we all have. It isn’t just people working in creative roles that have unique ideas, everybody has them and everyone should have an opportunity to contribute to the new website. It will be a better experience for our visitors as a result. 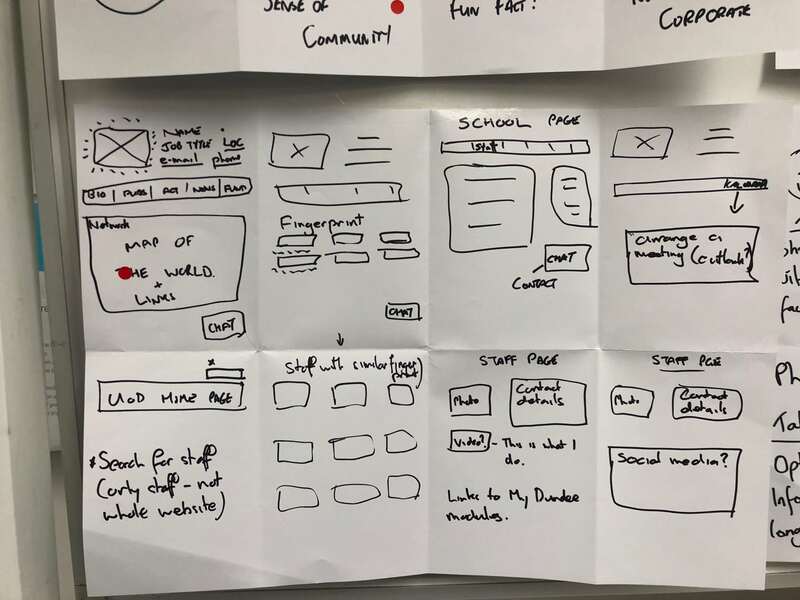 There were two solutions that, based on the votes and a group discussion, were taken forward to the next stage (prototyping). A prototype is an experiment to test out a hypothesis. We created a prototype based on chosen solutions, combining ideas from them both into a visual concept. We can use this prototype to get a reaction and learn something tangible (without spending months building a full solution). Although the prototype isn’t necessarily the final design, it was realistic enough to enable an assessment to be made about the viability of the ideas it contained. Do people like large images on this kind of content? Are ‘roles’ better than job titles? Is live chat a potentially useful feature? We’re trying to answer as many questions as possible relating to how people might find staff profile information like publications, contact information, location, etc. Please take a look at the staff profile prototype and add your comments (keeping in mind the problem we are trying to solve). We have already received a good amount of feedback. We can see things that we need to change, things we might have missed out completely, as well as confirmation of things that do work well. Your feedback is important and we’re grateful to have it. On Day 3, our team ran user tests to get feedback on the prototype. Watching our users try out the prototype is the best way to discover major issues with the solution, which in turn enables us to start iterating and improving the concept to help us solve the problem. This prototype has been added to the Alpha website and will be tested with our visitors. 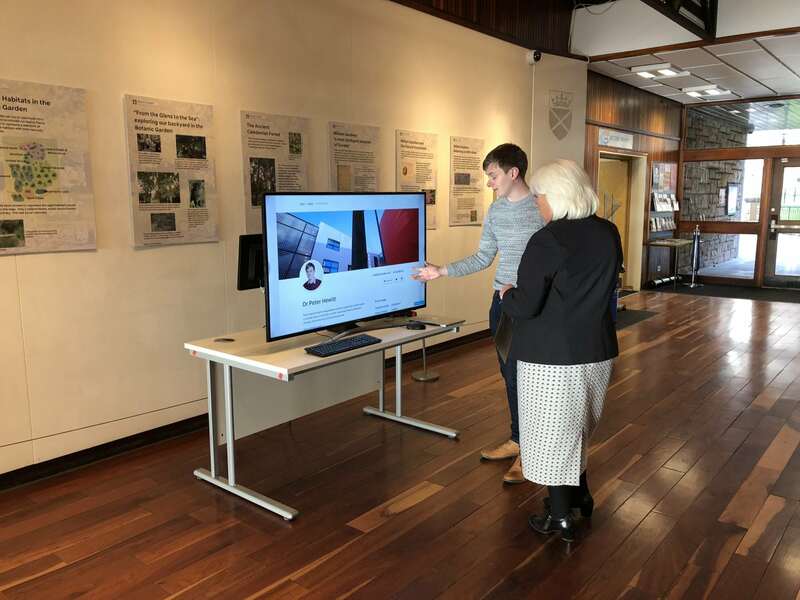 We are also continuing to test it across the university, gathering as much feedback from staff and students as possible. The concept will be evolved based on the feedback we receive. If you have attended the sprint or left a comment on the prototype, we will contact you at a later stage to get more of your valued feedback as the project progresses. A huge thank you to all of the attendees of our first Design Sprint. We really do appreciate your time and input. You have told us that you enjoyed the day and the process – we did too!